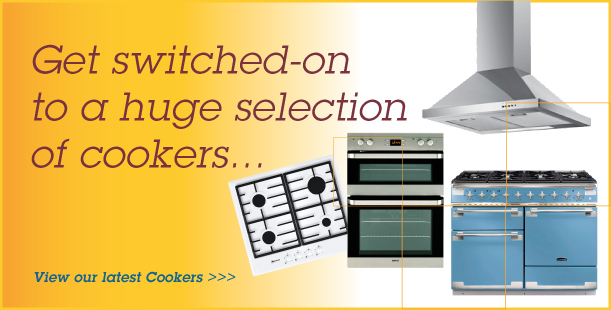 Here’s a brief guide to the wide range of cookers available. For a more detailed chat with our expert staff why not visit our showrooms and we can make sure you choose exactly the right option. As Cumbria’s only Rangemaster Design Centre we have at least ten Rangemaster products on show at any one time for you to view. We’re also Cumbria’s only Stoves/Belling Range Centre showcasing ten or more Stoves and Belling Ranges. Range cookers have become a popular choice for people wanting an impressive focal point for their kitchen, we offer a variety of sizes and fuel types. Sizes include 90cm, 100cm and 110cm width. Dual Fuel a combination of gas and electric. Electric ovens and a gas top are the preferred mixture. Electric with either a ceramic or induction top – both tops are finished in glass for a smooth surface area. We offer a range of complimentary products for your Range Cooker including Hoods and Splash Backs. When creating your kitchen, built in appliances are often the preferred choice to complement the overall design. Ovens – The first consideration when buying an oven is to decide what you want it to do. There’s much more possible than simply heating up food – as you consider models higher up a range more features become available. For instance basic models may offer a simple fan oven & grill combination but more sophisticated models will offer other features such as easy clean facilities and multifunction ovens which allow the user to select settings which mimic pizza ovens or rottiserie ovens. Built in ovens – Available as single or double options. We find that built in ovens are popular because they can be fixed at a height that is suitable for the person using the appliance. Double ovens have two separate cavities that is ideal for preparing dishes that require different temperatures. With advances in design and size options, slot in cookers have become a popular focal point for today’s kitchen. We offer a variety of fuel types and sizes to accommodate all modern work units. An induction top works using a magnet so It’s worth checking that your current pans are suitable to use. You can find out by running a magnet along the base of the pan to see if it sticks – if it does your pans are good for use! If you’d like more advice on selecting a Cooker why not call us or visit our Showroom, we’re always happy to help!